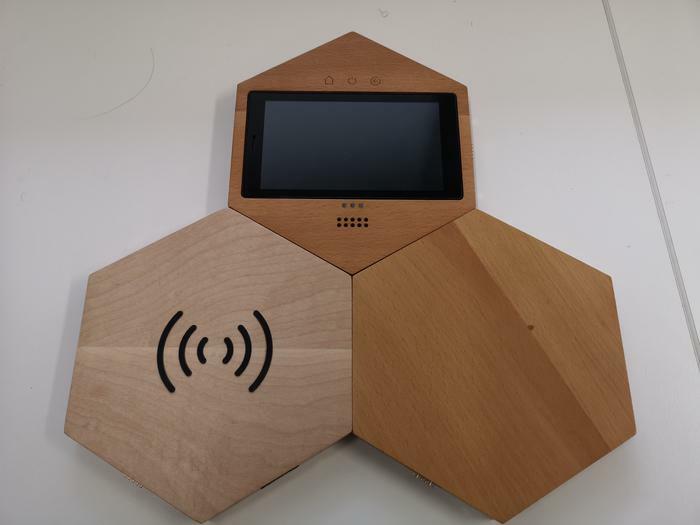 Like any good innovation, Pitaka’s MagHive “smart reminder” hub is based around a solid, old-fashioned, everyday dilema. We’ve all been there: You leave your house, but forget your keys, wallet or your phone - all of which are pretty important. Obviously, there’s no shortage of existing solutions to this problems from the classic Post-It notes to reminder apps to the recent wave of Bluetooth tracker products like Tile. First seen at this year’s CES in Las Vegas, MagHive takes this idea a little further than most - marrying up the technology required to track your essentials with software designed to remind you to do so and a delightfully modular hardware design. The MagHive is a set of hexagonal tiles that magnetically snap together in various configurations. Pitaka call this design ‘Hexa-Infinity’. They can be wall-mounted or placed on a bench. Regardless of where you want to put them, the tiles are designed in such a way that you can arrange or dissemble them at will. Important detail: not all of the modules carry the same qualities. At this stage, Pitaka are offering three variants. There’s one with built-In Qi charging. There’s one with NFC connectivity and there’s a tile with an Android-powered smart display. The first two are magnetized, the last one isn’t. The MagHive also comes with two pack-ins in the form of a magnetic keychain (which you can use to make your keys pairable) and a magnetized card (that lets you pull off the same trick with your wallet). At this stage, the standard MagHive kit comes with just the above. Obviously, the idea is that, in the future, Pitaka can eventually sell you additional modules based on your needs. The possibilities here are really rich: it’s easy to imagine a Google Home or Amazon Alexa tiles slotting into the mix alongside more conventional fare like a USB-hub. 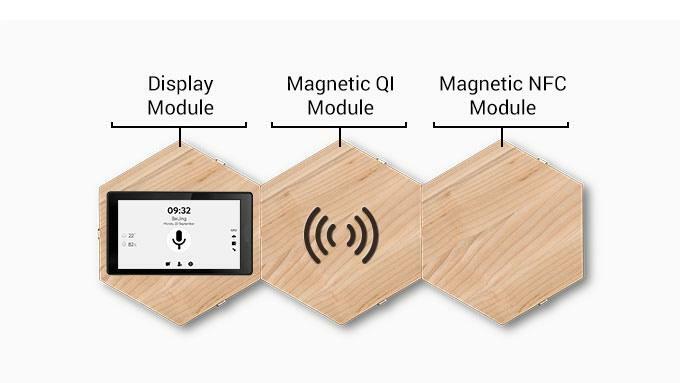 There’s also a software component in both the form of a dedicated app you put on your phone and the on-board software experience built into the MagHive tile which features a smart display. Once you’ve set up the former, you’re able to pair it with the latter. 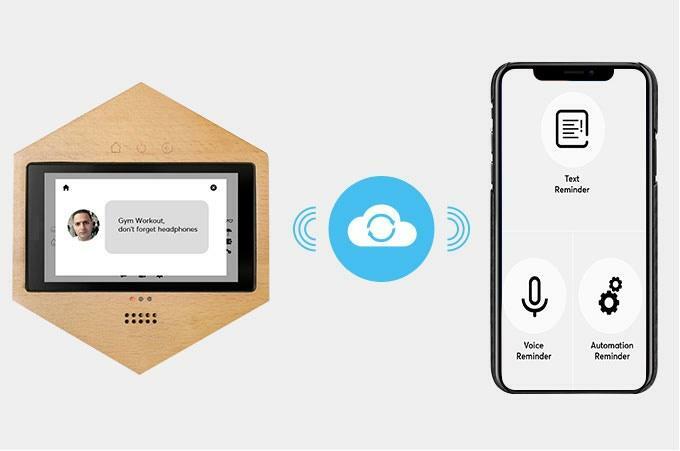 You can register different users, assign items (be they natively-NFC connective or not) to those users and set reminders or messages for them. There’s even a form of Family Tracking that’ll let you know when users come and go from your home (assuming they remember to put their keys / wallet / phone onto the MagHive) and alert you if they aren’t home by a certain time - which could potentially make the MagHive appealing to parents. 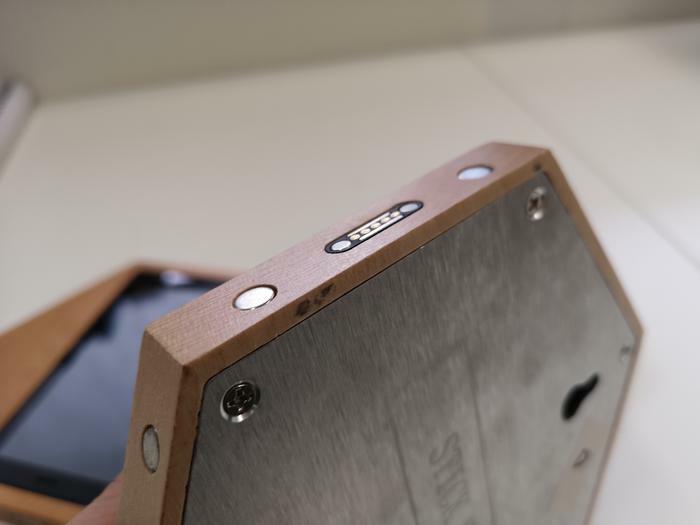 To be honest, the Hexa-Infinity design and snappy modularity of the MagHive is by far its strongest quality. Even if you’re a little limited out of the box, I like the overall look enough that the the idea of building out a grid of flexible tiles with different uses is really compelling to me.The build quality on the tiles themselves is also quite nice. Of course, with those pros, comes a basketful of cons. For one, not every phone out there supports Qi charging. 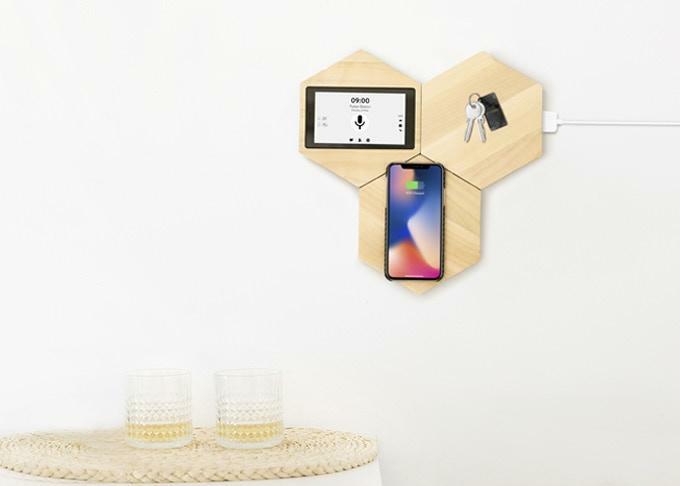 If you’re using a device that doesn’t or would prefer to get the most out of your phone’s fast-charge capabilities via wired charging, then using it with the MagHive doesn’t make a huge amount of sense. Even if Apple has finally jumped aboard the wireless charging bandwagon, the absence of any traditional wired charging options here seems a little premature. Then there’s the software experience on the MagHive. Yes, we were sent a prototype. Our impressions are based on what is a work in progress. There’s still plenty of time for Pitaka to improve this side of things before bringing the product to market. However, in its current form, the MagHive’s software experience needs a lot of work. Both the smart display on the MagHive and the app on our phone constantly crashed and were generally-speaking not very intuitive to deploy and use. The former is probably the worse of the two. It seems in dire need of a proper tutorial or on-boarding process that goes beyond just watching Youtube videos of how to do this or set that feature up. In short: it didn’t take long for us to run into problems and question whether the additional utility or value of the MagHive could really be worth this much additional hassle. We already have so many different apps and services on our phones that justifying another one - let alone what with a purpose that I could theoretically off-load to either a messenger service, the Google Assistant or a calendar app - is already an uphill battle and the MagHive’s smart display tile fails to make a compelling argument in its favor. The speaker doesn’t sound very good, the touch-sensitive control keys above the unit are super finicky to use and the display itself isn’t of a particularly high quality or resolution. Lastly, on a more practical level, wall-mounting the MagHive seems like a dicey at best. Our experience with the prototype found that the magnets in the tiles weren’t really strong enough to keep a grip on my wallet unless I emptied out most of it. Based on that, trusting the magnetized Qi charger with your phone seems like you’re asking for trouble. Your mileage is going to vary here based on what phone you use but that variability in of itself feels like a problem that Pitaka haven't really accounted for. Then, there’s the cabling. In order to actually use the MagHive, you’ll have to run the proprietary charger cable into one of the tiles in your setup. There’s a bit of flexibility here - which is nice - but the cable itself is only about a meter long - meaning you’ll probably to look into an extension if you want to put the device somewhere that isn’t close to a power plug. 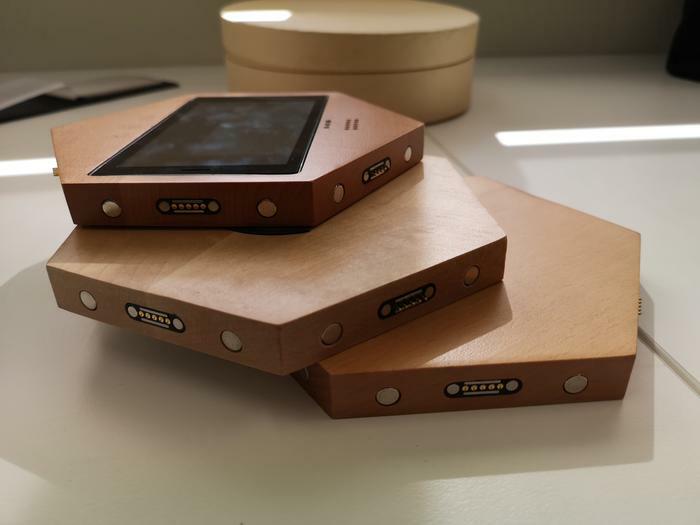 MagHive are currently raising funds to sell this product on Kickstarter for just shy of AUD $400. However, at that price and in its current form, that feels like a hard ask. If you’re after a dedicated wireless charger, you’d save a ton of money by picking up something like Belkin’s Boost Up pads and if you’re after a reminder app - there are plenty of other and better options already out there. The MagHive is a really cool concept - and a fair bit of fun to assemble to boot - but, when it comes to the real-world value it adds, the math doesn’t really add up here in Pitaka’s favor. Both on a hardware and software level, our initial impressions of the prototype MagHive we were sent weren’t what we hoped they would be. Hopefully, Pitaka still have enough time to amend at least some of these issues before delivering the final product. if you are interested in taking a look and deciding for yourself if the MagHive is worth your money, Pitaka are selling the product via Kickstarter here.